Shepherd sophomore starting pitcher Taylor Stocks (20), pictured here in a home game against Notre Dame on Monday, March 26, took the loss for the Rams in the first game of the day against the Golden Rams. Stocks allowed five runs (four earned) in four and two-thirds innings of work against the Golden Rams. (William Ransom/The Picket). 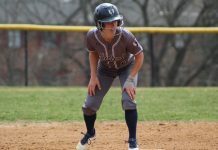 The Shepherd Rams softball team (13-7, 5-3 MEC) went on the road to West Chester, Pennsylvania, on Tuesday afternoon, March 27, to take on the West Chester University Golden Rams (15-8) out of the Pennsylvania State Athletic Conference (PSAC), where they were able to take one out of two games against the Golden Rams. The Rams suffered a shutout in the first game, but rallied for a 7-3 victory in the second game of the day against the Golden Rams. 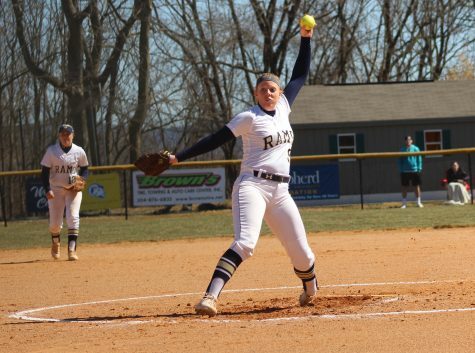 In the first game of the day, Shepherd continued its offensive struggles that it displayed against Notre Dame on Monday, March 26, as they were held scoreless by the Golden Rams and senior starting pitcher Amanda Houck (W, 9-3). Houck allowed just one hit and baserunner for the Rams in the first four innings of play, recording six strikeouts in this span. The only real trouble that Houck got herself into came in the top of the fifth inning. Shepherd had three straight batters reach base in the top of the fifth inning with two singles and one fielder’s choice by the Golden Rams’ defense. The Rams had the bases loaded with one out, desperately trying to score the game’s first run in what was shaping up to be a pitcher’s duel between Houck and Shepherd sophomore starting pitcher Taylor Stocks. Unfortunately for Shepherd, Houck get Rams senior pinch hitter Molly Staley to strike out swinging, while getting senior Sarah North to ground out to third base, ending the scoring threat from the Rams. This would turn out to be a big missed opportunity for the Rams, as the Golden Rams would go on to pour in five runs in the bottom of the fifth inning to take a commanding 5-0 lead. The inning started off really poorly for Shepherd, as Golden Rams senior left fielder Madison Kelly reached first base on a bunt attempt. In the next at-bat, junior designated hitter Alyssa Herion reached first base on a fielder’s choice. Thanks to an error by Shepherd sophomore third baseman Allison Baker, Kelly was able to advance all the way to third base on the play. After Herion stole second base, sophomore short stop Courtney Stump drove home Kelly for the game’s first run, as the Golden Rams now led 1-0. Following another stolen base by Golden Rams sophomore pinch runner Caroline Adams, junior Heidi McCollester doubled down the left field line, scoring both Adams and Herion on the play. Now with a 3-0 lead, the Golden Rams were looking to deliver the knockout blow to the Rams. Back-to-back RBI-singles by senior second baseman Sara Ercolani and senior catcher Cat Hammer to third base and right center field, respectively, brought the Golden Rams’ lead to 5-0. The Golden Rams’ scoring onslaught would end there, but not before the damage had already been done. 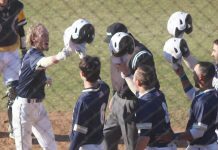 In all, eight Golden Rams’ batters managed to reach base in what was a frustrating fifth inning for the Rams to say the least. Over the final two innings, the Rams were never really able to make a serious comeback attempt. Junior Kaitlyn Konopka was the only Ram to reach base in the final two innings of play, as she drew a walk in the top of the sixth inning. Shepherd was not able to get Konopka home or generate any hits in the final two innings of play, clinching the 5-0 victory for the Golden Rams. Houck really locked down the Rams’ lineup in earning the complete-game shutout for the Golden Rams. Against the Rams, Houck allowed just four hits, walked one, and stuck out eight batters in what was an all-around complete performance for Houck. Stocks (L, 1-1) matched Houck nearly step-for-step for a while in the game, but the bottom of the fifth inning turned out to be a nightmare for her and the Rams. In four and two-thirds innings on the mound, Stocks allowed five runs (four earned) on four hits, walked two, and struck out three. Shepherd senior starting pitcher Kaitlin Munda (9), pictured here in a home game against West Virginia Wesleyan back on March 18, had to be pulled in the second inning of the second game of the day against the Golden Rams after command issues, but junior relief pitcher Lori Sturgill, who stepped in for Munda, did a solid ob for the Rams. 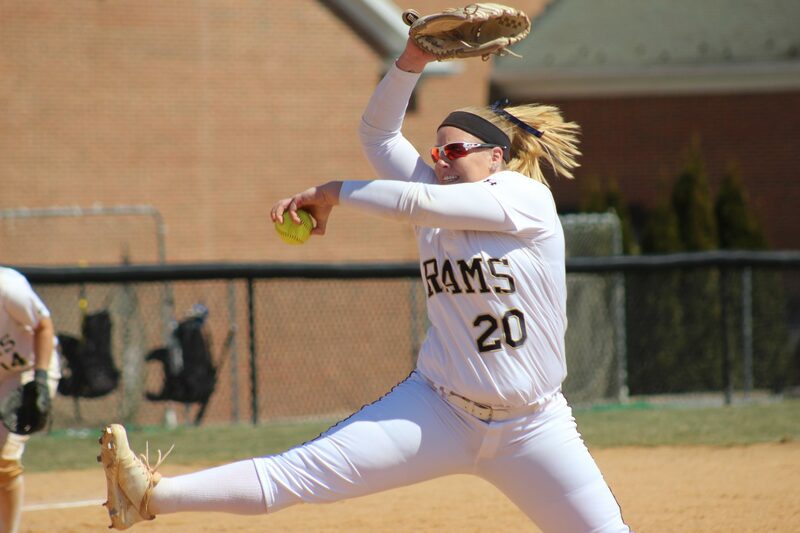 Sturgill limited the Golden Rams to two runs in over five innings in her relief appearance. (William Ransom/The Picket). Things would turn around very well for the Rams in the second game of the day, in which they came out with a 7-3 victory. The Rams got off to a hot start offensively in the top of the first inning with a two-RBI single up the middle that brought home junior relief pitcher Lori Sturgill and junior right fielder Morgan Cox, giving the Rams a quick 2-0 lead. Shepherd senior starting pitcher Kaitlin Munda had trouble taking care of that 2-0 lead in the bottom of the second inning, as she displayed tremendous difficulties locating and commanding her pitches. After Stump reach first base on a fielder’s choice off of a ground ball, Munda hit McCollester with a pitch in the next at-bat. Munda then proceeded to walk Garber, making the bases loaded with two outs. In the next at-bat, Munda allowed the third-straight Golden Rams to reach first base without giving up a hit by walking freshman center fielder Annamarie Hartman. This allowed Golden Rams junior pinch runner Sarah Byham to come in to score to reduce the Rams’ lead to 2-1 in the bottom of the second inning. This turned out to be all that the head coach of the Rams, Marissa Leslie, had to see, as she put in Sturgill to replace Munda on the mound. Munda was moved to the designated hitter position as a result of the move as well. Sturgill then got the Rams out of trouble by getting Ercolani to ground out to second base to end the inning. 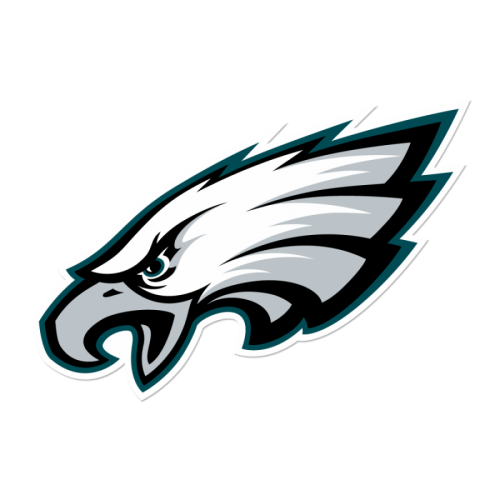 The Rams knew that they had to get going again offensively. The Golden Rams were coming, bringing the pressure back to the Rams to do something about it. Shepherd would form an answer of their own with two more runs in the top of the fourth inning to give them a 4-1 lead. Senior Jessica Robinson, after singling up the middle, advanced to second base on a passed ball off of a bad throw by Golden Knights junior starting pitcher Kelly Tinsman. Konopka singled to first base off of a bunt attempt later on in the inning, as Robinson advanced to third base on the play. Cox then grounded out to Stump, but this gave Robinson ample time to get to home plate on the play, increasing the Rams’ lead to 3-1 at this point. Konopka was brought home in the next at-bat thanks to an RBI-single through the left side of the Golden Rams’ defense by freshman second baseman Leann Brown, elevating the Rams’ lead to a 4-1 score. These two runs would be the first of five runs that the Rams would score over the course of a three-inning stretch that saw them take a 7-1 lead. Munda drew a bases-loaded-walk in the top of the fifth inning that brought home junior pinch runner Ariana Ramirez, giving the Rams a 5-1 lead. An RBI-single to right field by junior third baseman Rachel Taylor and an RBI-double to center field by Staley, respectively, stretching the Rams’ lead to 7-1 heading into the bottom of the sixth inning. These RBIs from Taylor and Staley put the finishing touches on what was a very dramatic improvement for the Rams offensively compared to their outing in the first game of the day against the Golden Rams. Hammer did everything she could to get the Golden Rams back in the game with her RBI-double that to center field that drove home Hartman and Garber to reduce the Rams’ lead to 7-3 in the bottom of the sixth inning, but the Golden Rams were not able to generate another hit in the contest. This cemented the 7-3 win for the Rams, a win they needed after losing their previous three games and struggled mightily offensively. Sturgill (W, 5-4) pitched the final five and one-thirds innings for the Rams. Despite allowing two runs on six hits, Sturgill made numerous plays to keep help keep the Rams’ lead in tact. Sturgill walked three and struck out four as well against the Golden Rams in the second game of the day. Golden Rams redshirt-freshman starting pitcher Maegen Kavanagh (L, 2-5) lasted just two-thirds of the first inning against the Rams, as she would go on to take the loss for the Golden Rams. Kavanagh surrendered two runs on two hits and walked two Rams in what was a disappointing outing for Kavanagh to say the least. 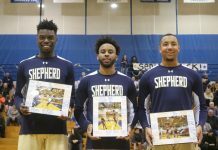 Shepherd will look to get push its win streak to three games on Friday, March 30, when it travels to West Liberty, West Virginia, to take on the West Liberty Hilltoppers in what will be a double-header. Game one begins at 2 p.m., followed by game two at 4 p.m.
Next articleBlue Town Red State Episode 10: Should assault weapons be banned?